Both stern legs are fabricated from Miami Cordage's double braid nylon, this rope is used for it's shock absorption properties. Our standard lengths for tow legs range from 40 - 60' with 3/8" - 1-1/2" diameters available, depending on the weight you are towing. We also offer custom lengths and diameters to meet your specs. Choose color the color of nylon double braid for your stern legs, we offer white, black, and navy blue, however custom colors are available. For the stern connection, we typically hand whip the bitter ends. 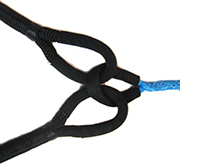 However, we also offer eye splices with available chafe gear. Our standard y-point connection joins the legs of the bridle by hand splicing soft eyes at the joining end of each leg. We recommend covering each eye with chafe gear to protect the ropes from fray. We have found this method to be the strongest connection between the legs of the tow bridle, however as each bridle is custom made, we also offer stainless steel hardware connection if this is your preferred method to join the legs of the bridle. The tow leg of your bridle is fabricated with 12-strand Dyneema® rope which allows for higher performance and towing capacity yet is lighter weight and will float. Typical length is 150' however we will fabricate the length and diameter to meet your specs. Our snubbers are also custom fabricated and are useful as a quick disconnect of the tow bridle from your vessel. 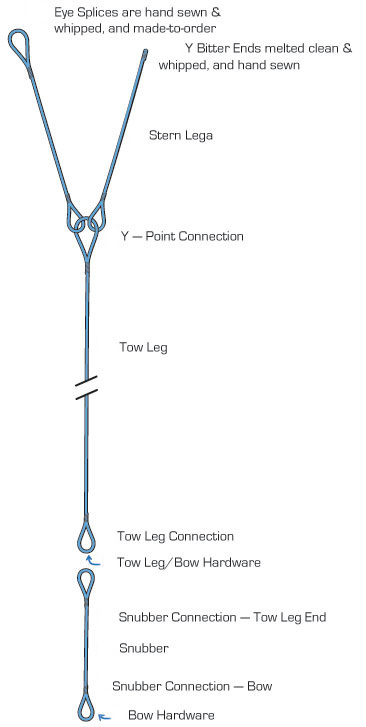 The snubber line is also useful when the towed vessel has a large freeboard, making it difficult to reach and disconnect the tow leg from the bow area. Similar to the tow leg, the snubber line is also fabricated from Dyneema® rope, making it lightweight and will float, although the weight of optional thimble eyes and stainless steel hardware may sink the snubber. 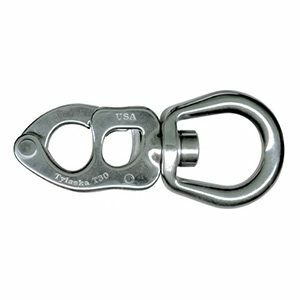 Our snubber lines come standard with stainless steel thimble eyes on both ends and a stainless steel bow shackle for connection.